The Anonymous Mint has partnered with The Mucha Foundation on the production of a series of stunning silver rounds celebrating the most famous works of Alphonse Mucha. The rounds will total six designs in all, with 1 oz and 5 oz weights available in proof, antique, and colorized proof versions. Today, the 1 oz Proof Colorized Silver Mucha Collection Dance Round is available to you online at Silver.com. Ships to you in a protective plastic capsule with Certificate of Authenticity. Second design in the Mucha Collection from Anonymous Mint! Mintage of colorized rounds is limited! Design concepts from Julie Lindquist. Original artwork by Alphonse Mucha. 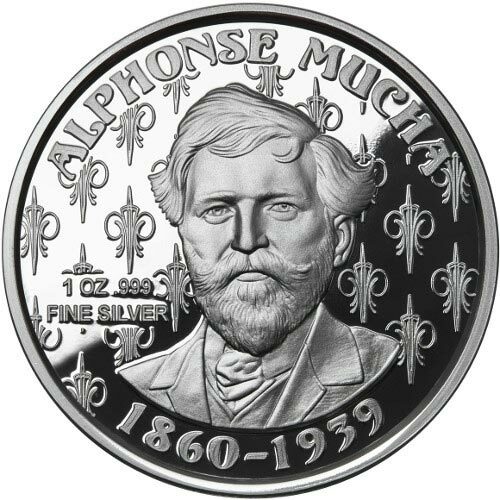 Reverse includes a portrait of Mucha. Obverse bears the seductive image of Dance. Dance is the second release in the Mucha Collection, and displays the seductive figure of a female with long, auburn hair. Mucha’s depiction of Dance captures her long hair flowing in a gentle autumn breeze as leaves fall around her. This design was originally captured in pencil and water color, and later released as a color lithograph. Today, Mucha is considered the father of Art Nouveau, and his set of six different art series from 1895 to 1900 are viewed as critical to his position in the art world. Among his achievements, these art collections from this timeframe are credited with bringing art to the masses because his works were affordable and repeatable, making it possible for more people to purchase and own art. Each of these 1 oz Proof Colorized Silver Dance Rounds has a beautiful, clear-mirrored finish on the background fields. Your purchase of the Dance Silver Round today includes a Certificate of Authenticity with individual serial number reflective of the edge lettering on the round itself which bears that same number. On the reverse of the 1 oz Proof Colorized Silver Mucha Collection Dance Round includes the image of Mucha taken from an actual full-size photograph of the Czech artist. For the round series, a close-up shot of his head was chosen, and is surrounded by engravings of his name, birth year, death year, weight, metal content, and purity of the round. 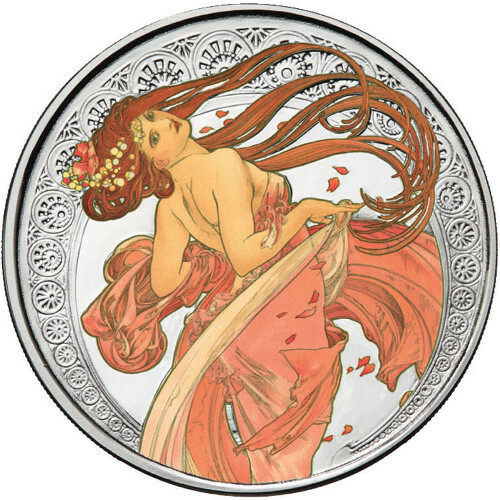 All 1 oz Proof Colorized Mucha Collection Dance Silver Rounds feature the sinuous figure and long, swaying hair of Dance on the obverse. She is depicted looking back over her shoulder at you, her figure tight as she stands on her tiptoes while her auburn hair flows in the breeze. Please don’t hesitate to contact Silver.com with questions at 888-989-7223. You can also connect with us online using our live chat and email features, or visit our website to research the price of silver when buying.